Fong See arrived at the Port of Seattle on the S.S. Iroquois on 22 May 1911. She was applying to be admitted to the United States as the lawful wife of Lee Yew, a merchant at On Lee Company in Portland, Oregon. Ellis DeBruler, Immigration Commissioner, wanted to expedite her landing. She was forty-six years old with bound feet; the only Chinese woman in the detention house. She was suffering from extreme loneliness and cried a great deal. 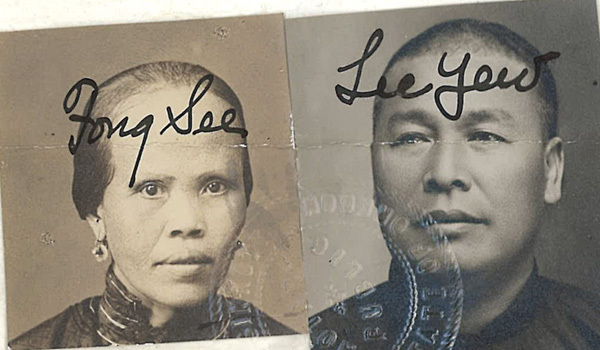 “Fong See & Lee Yew Affidavit Photos” 1910, Chinese Exclusion Act case files, RG 85, National Archives-Seattle, Fong See case file, Portland Box 13,file 2409. On 10 September 1910 Lee Yew made an affidavit to establish his status as a Chinese merchant and that of his wife, Fong See, as the wife of a merchant so she could join him and his son in Portland. Thomas G. Farrell, age 43, testified in 1911 that he had been living in Portland for almost 43 years. He was a merchant in wholesale groceries on Front Street. He knew many Chinese and was acquainted with Lee Yew for five or six years. Lee Yew bought his poultry and eggs from Farrell so he was at Farrell’s business at least once a week. John B. Coffey was in the tailoring business in the Elks Building and had been living in Portland for twenty-five years. He knew many Chinese socially and through his work. He and Lee Yew were acquainted in Salem, Oregon before Lee Yew came to Portland. Coffey was a witness for Lee Yew when his son came to the U.S.
After Inspector Hussey was satisfied that Lee Yew’s mercantile status was established, he interrogated Lee Sun Hing, the son of Fong See and Lee Yew. Lee Sun Hing was born in China and arrived in the U.S. at Sumas, Washington in 1908 and was admitted as the minor son of a merchant. He was a student and after his Lee Yew’s death he inherited his father’s interest in the On Lee Company. Lew Yew was too sick to testify about his status as a merchant and his marriage to Fong See when she arrived in Seattle in 1911. He died within a few months after Fong See’s arrival. Fong See was admitted as the lawful wife of Lee Yew and went to live above the On Lee Company store in Portland with her son. “Seid Juck Family Portrait,” ca. 1917, Chinese Exclusion Act case files, RG 85, National Archives-Seattle, Seid Quay Fong (Foon) and Fung Shee case file, Portland, Box 31, 4242. 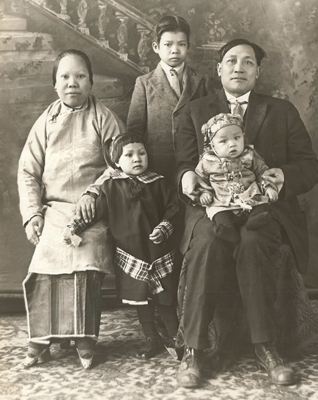 Fung Shee and her daughter, Seid Quay Fong (or Foon), arrived at the port of Seattle, Washington on 3 June 1915 and were admitted four days later. Fung Shee’s husband, Seid Juck, was a merchant and manager of the Wing Yuen Company at 208 First Street in The Dalles, Oregon. The file tells a complicated story. Seid Juck and his first wife adopted a son, Sher Lun. After Seid Juck’s wife died, his first cousin, Seid Dai, who was visiting in China from The Dalles, arranged for Fung Shee, a widow without children, to live in Seid Juck’s home and take care of Sher Lun. Seid Dai (sometimes referred to as Seid Ah Dai) was a fruit rancher and contractor for laborers for the Seufert Cannery in The Dalles, Oregon. Fung Shee was thirty-one years old in 1915 and had bound feet. W. F. Watkins, Chinese and Immigrant Inspector in Portland, Oregon, explained the marriage situation in his report to J. H. Barbour, Inspector in Charge. Watkins said that Seid Juck and Fung Shee’s marriage was arranged by Seid Ah Dai and was “consummated by the bride coming to Seid Juck’s home to live.” “… according to Chinese custom, nothing additional in the way of ceremony is necessary when the bride is a widow.” Seid Juck arrived in China in October 1912 about a year after the marriage to Fung Shee took place. He returned to The Dalles in May 1913 with his son Sher Lun. His daughter, Quay Foon, was born four month later in China. Seid Sher Lun, age 11 in 1915, was attending school in The Dalles in Grade 2A in Miss Sebring’s class. Seid Juck’s marriage name was Seid Sing Gee. He was 52 years old in 1915. Other members of the Wing Yuen Company were Seid Wah My, salesman and buyer; Seid Lup, silent partner; Seid Wah Yim, bookkeeper and salesman; Seid Sui, silent partner; and Seid Sing, silent partner. The company’s annual sales were $5,000. F. A. Seufert, Jr. was a witness for Seid Juck’s 1912 trip to China. Seufert had known Seid Juck for about 12 or 14 years. He swore that Seid Juck was a bonafide merchant and performed no manual labor except that was necessary in the conduct of his business at the Wing Yuen Company. Arthur Seufert, age 37, was born in San Francisco and lived in The Dalles, Oregon for 35 years. He was a member of his family’s salmon cannery, Seufert Brothers Company, and swore he knew Seid Juck and his partner, Seid Wah Yim, for several years. The brothers both gave favorable and positive statements for Seid Juck. There is no information about Fung Shee in the file after 1915. In 1926, a letter in the file states that their daughter, Seid Quay Foon, age 14, applied for and received a Certificate of Identity. 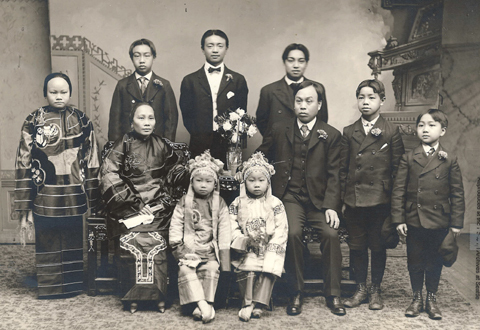 Law Lai family group photo, ca. 1901, Chinese Exclusion Act case files, RG 85, National Archives-Seattle, Law Lai file, Box 1224, Case 35100/4720. Front row: Law Haw Hong (died before 1921), Helen (Law Hing). Law Lai made an affidavit in 1901 to prove the he was a citizen of the United States; had the right to reside in the United States without a certificate of registration and he included a photo of himself for the purpose of identity. In 1922 Law Lai and three of his brothers applied to visit China. His application was approved. Law Lai, also known as William Lai Law, was born on 13 March 1888 at 2nd between Alder and Washington Street, Portland, Oregon, son of Law San, a tailor. Later on his father went into the cigar business and then owned the King Joy Grille in Vancouver, Washington until his death on 7 March 1921 in Portland. He is buried at Mt. Scott Cemetery in the Chinese section. Law Lai’s mother. Leong Soon, had bound feet. Law Lei had five brothers and three sisters. One brother and one sister died before 1922. They were all born in the United States except the oldest daughter, Law Ho. William Lai Law and his siblings had a private Chinese teacher, Fung Yin. William also went to Atkinson School, Portland Trade School, known as Benson Polytechnical School in 1922, and finally Lincoln High School. William registered for the draft in Chatham, Alaska on 1 September 1917. He was discharged at Ft. McDowell, California on 10 July 1918. In 1921 a white witness, Fred Gullette, physician and surgeon, testified that he had lived in Portland since 1897. He took care of the Law daughter who died of diphtheria and later the father who died of Brights’ disease about 1918. Dr. Locke attended to the birth of the children born in Portland. Another white witness was Michael Joseph Driscoll who lived in Portland since 1891 and was a neighbor of the Law family for many years.